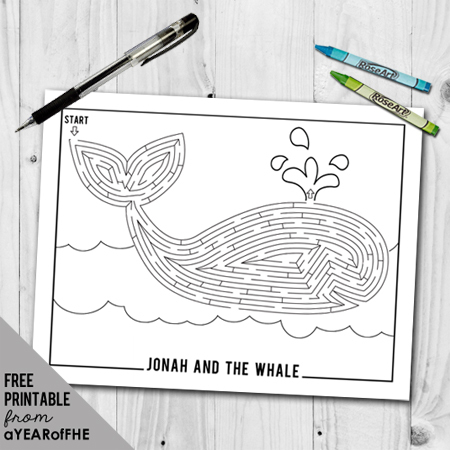 What You'll Need: scriptures, GAB Picture 27: Jonah, printed activity for each child, scissors, brass fasteners, coloring tools, pen/pencil. Scripture: 1 Nephi 3:7 - "...I will go and do the things which the Lord hath commanded, for I know that the Lord giveth no commandments unto the children of men, save he shall prepare a way for them that they may accomplish the thing which he commandeth them." But he later learned to listen and obey. That’s what Jonah learned deep down inside the whale. The Lord commanded Jonah to tell the wicked people of the city of Nineveh that if they didn’t repent, they would be destroyed. Jonah didn’t want to go to that wicked place. He didn’t think the people would listen to him or want to change, so instead of obeying the Lord he decided to run away. He got on a boat that was sailing west to Spain. A huge storm came and tossed the boat to and fro. The sailors cried out to Jonah, who was sleeping, to pray to his God to save them. Knowing that his disobedience was the cause of the storm, Jonah told them, “Take me up, and cast me forth into the sea; so shall the sea be calm unto you”. Though they didn’t want to, the sailors finally did as Jonah asked and threw him into the sea. 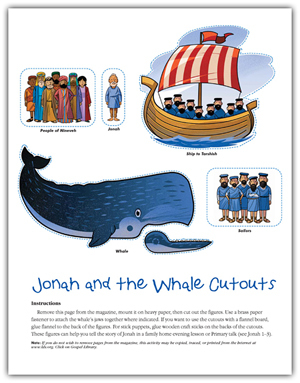 A great big whale swallowed Jonah and Jonah was in the whale's stomach for 3 days and 3 nights. While in the fish, Jonah prayed. He knew that he had disobeyed, and he wanted the Lord to forgive him. The Lord did, then caused that the fish “vomited out Jonah upon the dry land”. He again told the prophet to go to Nineveh. Jonah obeyed. To his surprise, when he told the people of Nineveh that the Lord was displeased with them and that they would soon be destroyed, they believed him and turned from their evil ways. They accepted the gift of repentance that would come through the Savior, and they were not destroyed. Both the prophet Jonah and the people he preached to had need of the atoning sacrifice of Jesus Christ so that they could return to Heavenly Father. Because this gift is given to everyone, we too can repent when we make mistakes. McKay felt terrible! He had been playing with his bubblegum and gotten it all over his hands. Then, to make matters worse, he had wiped the bubblegum off his hands and onto his bedroom wall. He knew his mother and father would be coming to tuck him into bed any minute, and he was afraid. He didn’t want to get into trouble, so he piled a toy box and some toys on top of each other until they hid the bubblegum mess. He shrugged his shoulders, hoping she wouldn’t figure it out. Father came in and sat next to McKay on the bed. “Well, shall we read scriptures?” he asked. “Yes,” McKay said. He loved reading with his parents every night. Father began to read the story of Jonah and the whale. McKay closed his eyes and listened. He could understand why Jonah didn’t want to go to the city of Nineveh and teach his enemies about the gospel. That would be a scary and hard thing to do. McKay’s father read about Jonah running away so that he wouldn’t have to obey God. But God knew where Jonah was no matter where he went. Heavenly Father had to send a whale to swallow Jonah in order to teach him a lesson. McKay frowned. 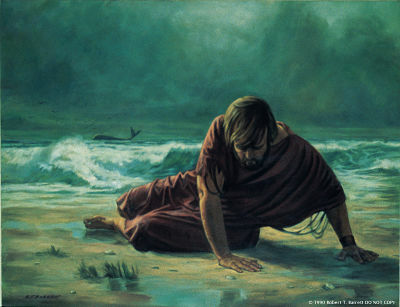 He thought about Jonah trying to run away and hide from God. McKay remembered the bubblegum mess on the wall. Even though his mother and father couldn’t see it, Heavenly Father could. “Mom, Dad,” McKay said, “I’m hiding something.” He went to the wall and uncovered the mess. Father shook his head. “Why did you try to hide that?” he asked. After he finished cleaning the wall, McKay knelt with his parents and said a prayer. Then, he climbed into bed. “I’m glad you learned a lesson tonight,” Father said. His parents laughed and kissed McKay good night. McKay didn’t feel terrible anymore. In fact, he fell asleep feeling great. We should always do what is right, even when it is hard. When we do, we will get blessings from the Lord and we can feel good inside, knowing we did what was right. Bear your testimony about doing what is right, even when it's difficult. Share a specific event from your life when you made the right choice in the face of hardship and the blessings you received. Practice Song: If you are teaching your family the MAY Song of the Month, go over the words and music with your family. Treat: Goldfish Crackers or Swedish Fish. 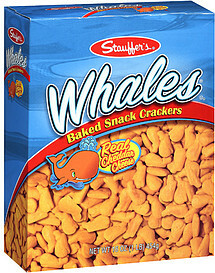 Our local grocery store has a generic brand of Goldfish crackers that are actually little Whales. I wanted to say thanks so much for putting these lessons together. It has made all the difference in whether we will be having FHE or not some weeks! Thank you for the Jonah and the Whale lesson---our kids can't be taught this lesson enough---to do what is right, even when it is hard! Thank you so much for giving your time and talents for this great cause. These lessons are awesome and are making a big difference for lots of families. We have been reading the new testament for our scripture study this year and I am excited to share this lesson. thank you for all of your hard work! I tried this on my 18 month old and she loved it! I condensed the lesson because her attention span doesn't last very long, but she loves pointing at her colored whale on the fridge.! We are currently studying Jonah and this lesson is perfect!!! Thanks a million and God Bless you and yours!!! I liked the "real life" example along with the scripture story. Adding the cute pictures to help tell the story was awesome. THanks! This is fabulous! I think this will be perfect for my 4 year old. Thanks for your hard work! Thank you so much for providing these wonderful FHE lessons. I am grateful for all of the work you have put into these. I love the link for the cutouts from the friend and also for the "real life" story! Thanks again! 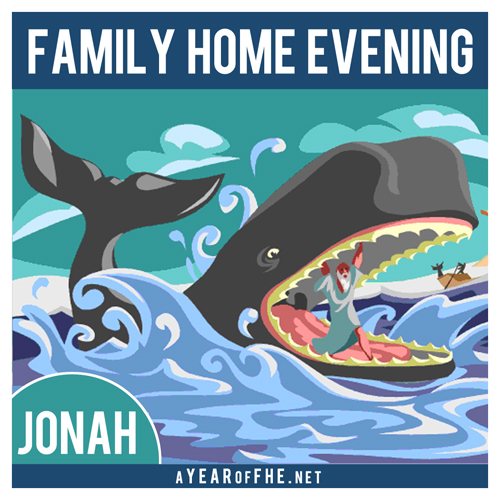 This is an amazing lesson of Jonah for my little ones. Thank you for all your work and kindness in sharing. I appreciate it.